The xLobby PAD RF Remote provides a simple to use remote control with a 1.38″ x 1.38″ touchpad for quick navigation of menus and webpages. Works from up to 50 ft. away. Contact Calrad for pricing and availability. This is a preview of the rotating background feature in a future release of V3. The options will include 1. A folder with unlimited backgrounds that rotate in order or randomly, 2. The ability to show images from the picture, movies, music libraries, 3. Images from a website or news feed mixed in with a static background and a duration timer control are just a few ideas. 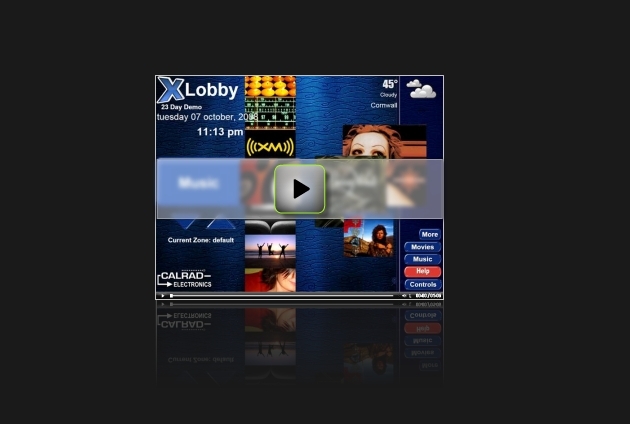 You are currently browsing the xlobby news blog archives for October, 2008.